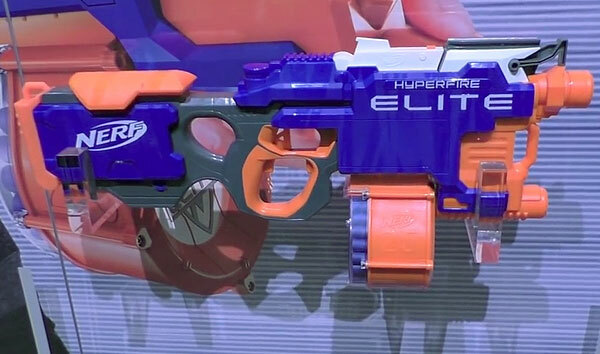 Hasbro calls the Nerf N-Strike Elite Hyper-Fire its fastest firing blaster. Does it live up to the hype? 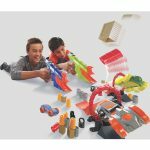 At Toy Fair 2016, Hasbro showed off all its new Nerf guns for 2016. 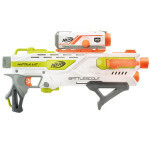 We were excited to check out the Nerf N-Strike Elite Hyper-Fire Blaster. 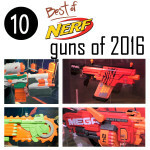 Is it best Nerf gun of 2016? Nerf N-Strike Elite Hyper Fire is part of the Elite line of blasters. Elite blasters focus on performance, distance, speed, and accuracy. This year Nerf is focusing on capacity. If you want to jump in and unload as many as darts you can, then the Nerf N-Strike Elite Hyper Fire has to be in your arsenal. This drum fed automatic dart gun is the fastest firing Nerf gun yet. Hasbro claims it can unload an impressive five darts per second. We can’t count that fast but it is probably the fastest unmodified Nerf gun we’ve seen. 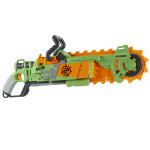 The blaster has a very futuristic design with cool tiger stripe pattern on the body. The profiling around the handguard houses the rev trigger and mag release button. It’s got a thumbhole, a hand hole, and trigger well. It’s surprising large enough to fit your hand in and feels ergonomic. The rev switch has a great response when pressed. The cheek rest on the top of the gun is a nice touch. There is a tactical rail on the top. The jam door on the top of the gun has a lock door switch. Powered by four D batteries, the weight is distributed to the back of the gun. The foregrip on the front makes it perfect for shouldering the weight. But how does it shoot? With a flywheel motor, it has serious rapid fire action. It shoots a hose of darts at unsuspecting targets. It’s actually a lot quieter than we expected and its performance destroys the Hail Fire. You have to be careful on the trigger or else you will churn through the 25 dart drum magazine in the blink of an eye, leaving you a wide open target.